This volume consists of expository articles on holomorphic spaces. Here researchers and graduate students will encounter Hardy spaces, Bergman spaces, Dirichlet spaces, Hankel and Toeplitz operators, and a sampling of the role these objects play in modern analysis. In his scholarly supplement to Riemann's complex mathematical theory, rather than offer proofs in support of the theorem, Klein chose to offer this exposition and annotation, first published in 1893, in an effort to broaden and deepen understanding. This course covers some basic material on both the geometric and analytic aspects of complex analysis in one variable. Prerequisites: Background in real analysis and basic differential topology, and a first course in complex analysis. 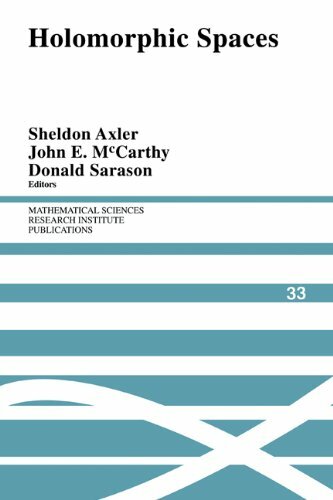 This book is a brief introductory account of some of the more fundamental portions of the theory of functions of a complex variable. It will give the uninitiated some idea of the nature of one of the most important branches of modem mathematics. Polynomials are the first class of functions that the student meets. Therefore, one may think that they are easy to handle. They are not in general! Topics as e.g. finding roots in a polynomial and the winding number are illustrated.